Welcome to today’s edition of Better Know a Young Millionaire Investor. 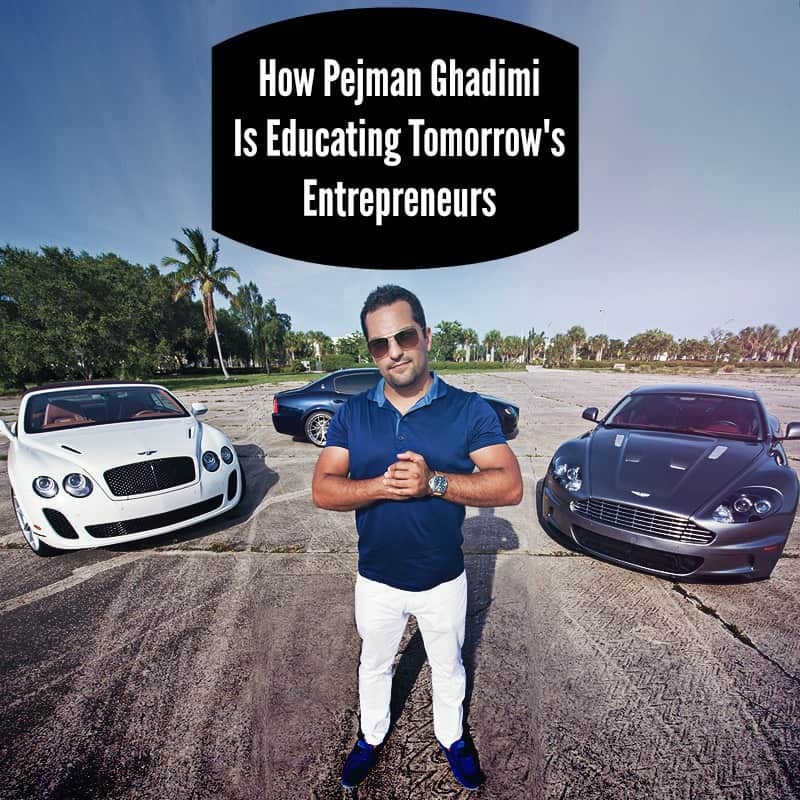 This week I’ll be chatting with Pejman Ghadimi, a self-made millionaire and now a consultant and entrepreneur. Pejman is the founder of Secret Entourage, a platform focused on providing support, motivation, and inspiration to Generation Y entrepreneurs. He is also the author of The Third Circle System, which is a course of books designed around leadership fundamentals and entrepreneurship training. It is based on Pejman’s 10 years of observations in business and interactions with other entrepreneurs. Pejman’s story is interesting because before making the jump to self-employment, he had a 6 figure job in finance and banking. A large part of this interview was originally published in March 2013. Flash forward to 2016, and Pejman is crushing it in the online entrepreneur education space (he considers the company a bit differently, but I think it get’s the point across). So we checked back in with Pejman to get an update and hopefully continue to inspire others. Pejman: I was actually born in Tehran, Iran in 1982, but only spend a very small amount of time there. I moved to Paris, France with my mom where I spent the next 11 years. After countless attempts to get a visa for the United States, we were finally granted one and moved to Los Angeles. We moved around a lot until we finally settled in Northern Virginia, where I finally stuck around for a while. Pejman: My education actually ended with my high school diploma. I always believed that you can only learn from those that have been there, rather than textbooks. If I had an opportunity today, I still wouldn’t go back to school or get a degree. All I can say is that if you plan to skip college, make sure you have a plan and are willing to work harder to get there. The only difference is that you’ll have a head start from those going to college and you won’t have any debt! Pejman: I started in sales at 14. I worked all through high school at random jobs. I spent the biggest part of my corporate career working for a major bank, which I worked up to a Vice President title before leaving. In 2005, I founded VIP Motoring, a luxury lifestyle concierge service. I grew my first offline venture to a six figure revenue company with no partners or support. I did it on the merit that I was passionate about the luxury lifestyle, was part of it, and knew how important customer service was. I treated my clients like family, and in return, they always trusted me. In 2006, I launched Secret Consulting, a business dedicated to teaching others how to be successful. I focused on teaching executives and business owners how to succeed through leadership training, support, and private mentorship. This same year I also launched Secret Entourage, which was geared at providing free support, motivation, and inspiration to Generation Y entrepreneurs. The idea evolved into a full-blown platform that combines lifestyle with business to bring a new level of innovation. Pejman: My first million was not from one particular thing, but rather a combination. Many people believe that millionaires make it by having a one-time hit. While some do, I think the majority combine a lot of hard work and multiple ventures to get there. For me, it was investing in real estate, investing in the stock market, and owning two businesses that allowed me to make it there by 25. Another key strategy was diversifying my income streams. This allowed me to make sure that I didn’t lose big if something unexpected happened, like the bursting of the real estate bubble. Pejman: For short term investments, I stick to the stock market. Right now its too easy to make 20% returns. Today’s stock market is very different than the old days. The market right now is driven by fear and greed, and the old rules don’t apply. If you know where to invest, you can make great returns. For longer term investments, I like real estate. Real estate provides both long term residual income and builds equity. I invest in states most hurt by the recession, so I will see a greater return in 5-10 years. Florida is currently my largest footprint where I own properties. Finally, I love startups. I love investing in other people’s innovative ideas. It’s highly risky, but it is my belief that if someone has a strong belief and passion for innovating the world, money should not stop them from doing so. Good people need support and help growing at times, and it can yield big returns in terms of equity/shares if you pick the right companies. Has your investing strategy changed over time? Pejman: Yes, partly because I used to care more about making money than I do now. Now, my desire has shifted more to leaving behind a legacy than making more money. I created Secret Entourage for that reason. When I was younger, my core focus was always looking for money-making opportunities. Now, I look for opportunities in general, even if they yield no returns. Three years ago when we first spoke, the economy was going gang-busters. Today it’s slowing down – should people change their mindsets during slowdowns? Pejman: Not at all. In every growing economy lies massive opportunities, but in every down turn exists even more of those same opportunities. Business is adaptive, meaning that you can’t rely on the economy to dictate if you win or lose. You must be proactive to change. In something as volatile and ever changing as the real estate market, a realtor would continue doing their job despite changing climates but would focus on rentals perhaps, instead of residential purchases, or would even engage in commercial real estate during times where conventional clients are hard to come by. There is this myth that every millionaire has seven sources of income, and while I certainly have more than one, I think of this in a different way. Every successful business has more than seven sources of revenue, allowing it to navigate and adapt with haste and strategy, and in most cases uncover even more opportunities. Many millionaires, including yourself, have made money through real estate. Why? Pejman: Real estate is one of the best and safest investments in today’s climate. What’s even easier about real estate is that you don’t even have to use your own money, and therefore it makes it a very attractive investment for many. Think about the fact that an average person can buy a home, live it in and use it for 3 years, enjoy significant tax breaks during that time, then sell it and pocket a huge sum of money tax free. Most people miss this because they buy their first home for comfort rather than its potential upside. Being a millionaire means you have to look at each and every action you take as a potential investment: your home, your car, watches and accessories, and more. Pejman: Making money does not come from owning a business, but from assuming risk. You cannot expect to be ordinary in your thinking and safe in your approach and expect results that are way out of the norm. Being an entrepreneur is about risk – it’s about putting yourself out there and pushing the envelope until you get there, with no guarantee of success. Investing is almost the same because you assume a risk and are rewarded based on the risk level. High risk, high reward. Low risk, low reward. You can become a millionaire by creating innovative businesses or investing money. You can also become one through a normal corporate career, but don’t expect that to happen before you’re 40. Even though it’s possible, it’s unlikely. There comes a time in your life where you realize that no matter how much money you make, the work you are doing simply holds no value anymore. You take a moment to look around you and see others performing the same job only to realize you no longer fit in and the people that once believed in similar things and in similar ways have all been replaced by people who look like blind robots. Its that time that you realize that those are the same people you started with and that it is you that has changed your perspective and views on what you do and where you work. We have all been there and have all felt that way, which is why we often go seek an alternative job elsewhere and only find ourselves in the same predicament 5 years later. It s a never ending cycle for those of us above the roles we currently hold in other people’s organizations. A point comes in your life where you have to make a choice as to where you want to be going and the way you want to get there. While many of us have had that honest conversation with ourselves, it is often letting go of the fear of uncertainty and insecurity that we need to get over. This can be quite difficult if you have not had a strong influence of entrepreneurs in your surrounding. For me that road came recently when I made a choice that I was far more superior than those I worked for and therefore the path I was taking was simply too easy, and the rewards in the long term way to small. It was a difficult journey letting go of the monetary rewards associated with just sitting there but certainly a necessary move in order to expand my reach to a new level of experience and certainly to attain a reward above and beyond that of the average person reaches for. The idea of letting go of that security and taking a chance on yourself is something that makes you significantly superior to those around you and a validation that you were right thinking you were superior. Your ability to overcome the fear and put yourself in a do or die situation makes you an exceptional individual and you should never forget that. Change certainly is not easy, and entrepreneurship certainly is much harder than most believe it to be. The rewards are greater but very few reach the end, and while the rewards usually motivate the majority to start, it is the journey that creates some of today’s brightest and most innovative entrepreneurs. It is those that are in the game to prove their ability to have an impact on society greater than the one their past boss believed them to be capable of, that become the legends we talk about in our day to day lives. Most of those that start for the rewards usually miss the mark or simply fall short. Often due to the fact that they never anticipate the rewards to take so long to come and often underestimate the difficulties behind the execution of their idea. This often leads to giving up and letting go only to seek alternative means to be rewarded faster. When I chose to let go of my job, I did so understanding that there is a chance I might fail but also a chance I might lose more than I started with. I also left with the understanding that we only have one chance at making the impact we want in the world, and even though many of you are waiting for you chance to come, I decided to create my own by taking a leap of faith, and believing in my own ability to bring forward the change I seek. I quit my job because I believed in myself more than I believed in the organization or people I worked for, and that was a pretty good reason to do so. Despite many of you thinking that you would never let go of a 6 figure job without having alternatives waiting for you, I urge you to rethink your position on life in general. If it holds true that most of us want to matter in the world and have an impact on those around us in a positive and memorable way, then why help build someone else dream only to find yourself one day faced with termination or retirement. Despite one looking better than the other, they certainly are both very poor choices and should not be a part of your plan, but rather only a stepping stone into attaining the skills needed to use in the real world and to bring your very own vision to life. One can argue that dropping a six figure job can be risky but I could argue that if you are not wiling to take risk, there can be no reward; and certainly not the reward I seek in my life. You get one life to truly live as you want, and that life is the one you have now. Regardless of what your past circumstance entails, it certainly doesn’t come with a disclosure that you cannot change your very own outcome at any time through you very own actions. On that note I will leave you with a saying I use quite often when coaching people and tell you that regardless of what your goals are, everyday you are dreaming of them, someone else is acting to reach them. Pejman: I live with no regrets. All decisions or choices I’ve made have been backed by actions to make them count. You said “live with no regrets”. Is that important? How do others get that same mindset? Pejman: Yes, very. We never know when our time runs out, and its important to have self satisfaction and fulfillment, or it will be in our last days that we will realize we have run short on time. Recently, I was diagnosed with a cancerous tumor which required surgery, and I’ll never forget the day when the doctor took me aside and said, “we don’t know what it is, and won’t know until we operate.” Obviously, as someone who never had cancer, never had a family history of it, it certainly put a lot of questions in my head. The biggest one was “what if I die tomorrow?” I realized when faced with the idea of death that I was very satisfied and felt no regret towards my life. It was an incredible feeling to know that, despite possibly leaving loved ones behind, there was nothing else that I wish I had done in my 33 years of life, and while my journey was and is far from over, I felt good about the journey so far. I think this is the point many people miss often. They focus so much on their own needs to achieve that they often miss their biggest achievements: the ones that happen on the journey, not at the destination. In order for others to feel this way, they must set their goals higher and work on things that matter. Too often we get wrapped up in the idea of setting money goals like “I want to be a millionaire,” but don’t focus on who we are, such as settings goal like “I want to be the best chef in Chicago.” When we work towards mastering a craft (which certainly will make you a millionaire) by focusing on external factors, we remain blind of the incredible steps we undergo in this process of change. What drove you to start out on your own versus just going the corporate route? Pejman: I didn’t want an ordinary life and therefore I knew I couldn’t work an ordinary job. Most value people by how much money they have made. I have always valued myself and others by how much of our fears we have conquered. The more you recognize your fears and are able to control them, the more you feel limitless. If you died tomorrow, what would you be remembered for? What would people who don’t know you say about you? What stories would they tell about you and what would they say you stood for? Whatever the answer is….is that what you WANT to be remembered for? If the answers are not the same, you are not living. You are only existing. Value time, not money. It’s easy to get lost wanting to make money, but then do you want that to be the answer to #2? For someone still trading time for dollars, how can they work to value time more? Pejman: Trading time for dollars is fine. It is what we must all do until we become so much more skilled and find new ways to leverage our talents. Since this by itself can be a 10 page answer, I’ll make it simple by saying that when you can’t earn what you believe you are capable of earning, then consider that you either lack skills and talent, or lack the ability to communicate or showcase such skill or talent. Either ways, you have work ahead of you. When I first interviewed you, Secret Entourage was just getting started. How’s it doing today? Any awesome stories you can share? Pejman: To be exact, when we first interviewed together Secret Entourage had been around for 3 years already, but it was just starting to pick up momentum and get more public exposure. The part most people always miss is the struggle part, which for us was the first 3 years in which nobody noticed us! Today, Secret Entourage is starting to finally live up to my idea of bridging the gap between formal and self education and we are taking leaps, no longer steps. 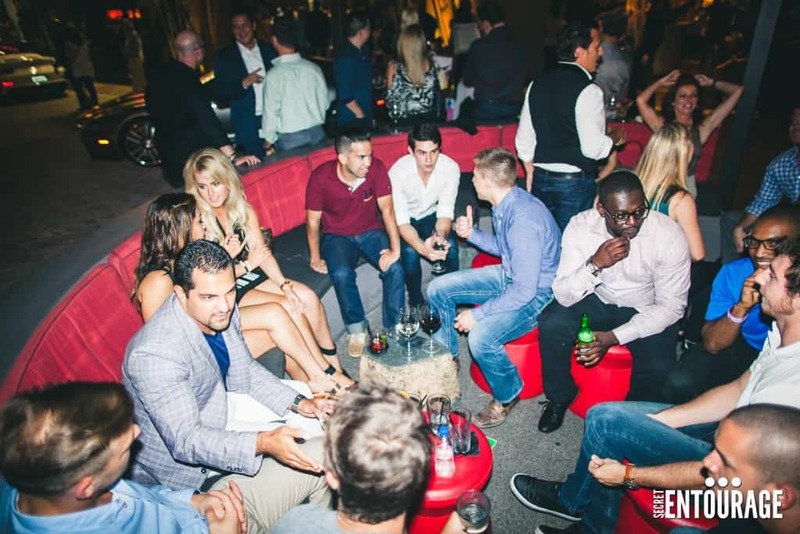 Over the past 2 years, over 100 incredible entrepreneurs committed to our cause including major names like Chris Pfaff (CEO of Young and Reckless Clothing), Andy Frisella (CEO of 1st Phorm), Fabio Viviani (Celebrity Chef and serial entrepreneur) and many more. We have been overwhelmed by incredible accredited people wanting to take part and help see our mission to the end. More importantly, we have also grown to well over 20,000 (up more than 15,000 since our last talk) hungry students who range from start up entrepreneurs, all the way up to people who have already building their 3rd and 4th company. Outside of our growth on the internal side of the site, we have also grown our reach to over 500,000 followers on social sites like Facebook and Instagram, and we have surpassed 400,000 unique visitors per month on our site. The incredible part is that these numbers is nothing compared to the awesome stories in the academy itself. I’ll share with you one of my favorite stories about two guys who never met each other before and leveraged the academy to launch a business in less than one hour. Thats right…one hour. One of the guys posted on our private Facebook group that he was looking to create vinyl stickers for a new project and was looking for any tips on who to contact. Another member happened to do vinyls on the side and stepped in and offered to help. In less than one hour, they had taken an idea, partnered up and created a business. We have another kid who created a carbon fiber company in less than 3 months, and after 12 months was doing $40,000 a month in sales consistently. Why is being part of a community so important? Pejman: People want to have an opportunity to belong to a group that is focused on helping each other stay motivated and understand the meaning of teamwork, even if they are very early on in their pursuit of entrepreneurship. What’s important to understand is that we are not an online education center, but rather a bridge for self education. 3. The third piece of the equation is to create a support group for people, meaning the ability to interact with others and help gain positive momentum both from a mindset standpoint, as well as having better people in your circles. Most people don’t realize how toxic it really is to be surrounded by people who are always telling why you won’t make it, instead of people offering subjective criticism and support to help you succeed. What can people who are lost in their careers/lives do to get re-motivated and find success? Pejman: Read Third Circle Theory. I know it may seem like a shameless plug but it really isn’t. Most of the answers we seek in life, the path we wish we would take, is all within our own ability and control, but no one has previously taught us to take advantage of it. By understanding how much awareness plays a role in our lives, we are able to live in the present and to create real change in our own lives. This happens in 3 major steps (which are completely broken down in the book). The first step is to understand that you are always in control of the environment you live or exist in, and while it may sound cliche, most people think that their environment is part of their issue. In other words, unhappy people at work tend to think their job is why they are unhappy, and this is never the case. It’s an illusion. It’s really more than their job, like perhaps their inability to be successful at their job, making them no longer try. Whatever the case, it is their acceptance that they are powerless, which must change immediately. The second piece is to understand how passion is born by looking at your talents, and learning to combine them with things you love. You see, love is an emotion, and passion is an extension of love, as it manifests itself when you love something enough to be willing to do something about it. Someone who loves cats enjoys their company, but someone who is passionate about cats starts a shelter, or a charity to help. The difference lies in the actions, which eventually convert our passion into feelings of purpose. The final piece is to understand that society and life are two very different things, and what you choose to do in your day to day routine doesn’t define how you live your life. It is only a small segment of your life, but one that must still be mastered. Understanding these three key elements enables someone to find self-motivation, and no longer needs to focus on external factors like money as means of staying motivated. Thank you Pejman for sharing your amazing story with us! I really appreciate you taking the time to answer my questions and share your insights with The College Investor readers. I always love hearing about individuals who left their “cushy” high level jobs and made the jump to self employment. When you talk about conquering fears, I can tell you that is one of my biggest. Once again, I really found it interesting that Pejman only went to high school and not college. However, I strongly agree with his thoughts – “All I can say is that if you plan to skip college, make sure you have a plan and are willing to work harder to get there.” I think that hard work is key and hard work isn’t taught in schools. It’s an accumen acquired in life. I’m also a huge believer in what Pejman said about risk and making money. I love how he said that owning a business doesn’t make you rich. In fact, I know a lot of business owners that struggle all the time to make ends meet. Pejman instead claims that risk is what make you rich. Going back to the business example, I would agree that the businesses that engage in smart risk taking are the ones who end up being successful. I’m also glad that Pejman pointed out that you can be a millionaire by staying the corporate world, but it will just come slower than other paths. This wasn’t a thought shared by others in the Better Know a Young Millionaire Series. Finally, I love Pejman’s advice to college students. Live how you want to be remembered, and does your vision match that of others around you? I think that too many people have a distorted image of themselves, and it is sad. I think this exercise is valuable to make sure that what you are doing aligns with your personal goals and values. What are your thoughts on risk vs. reward? What about valuing yourself on the fears you’ve conquered? This really was a fantastic interview. Thanks for posting it! I would definitely agree that if you want big reward you have to be willing to take on risk. The risk may be high but some planning and effort can bring it down to a more reasonable level. If the reward is high and the risk is moderate, is it worth going for? I would say so. I like that Pejman values success not to the amount of money made, but on fears conquered. This is really what it’s all about and ties in with the risk/reward aspect. Initially the fear you have is a part of your risk but the more you push through those fears and reduce them, the lower your risk becomes. Once you get to the point that the fear of risk becomes a non-factor then anything is possible. That is the core of what I believe. You nailed it. This is one of the best series I have seen on this site! Awesome IN DEPTH interviews with millionaires are invaluable. The interview with Pejman helped me confirm some things I already knew, my wife and I sometimes argue over our children’s education. I believe they would be served better by getting jobs once they entered highschool and foregoing college if they want to be successful entrepreneurs. In the meantime I want them to experience the world and the endless possibilties that are available to them. They will be reading interviews like this around the ages of 12 & 13! Additionally it’s great to see hard working people succeed and be so humble. Great interview, keep them coming! It was a pleasure doing the interview with you. Thanks for having me on your site. Rob, again, great interview, I love this series. Not only is it very interesting to see what people have done to build their wealth but it’s very entertaining to see their characters come out in your interviews. My only question is why is this only the third installment in this series, we want to see more! !